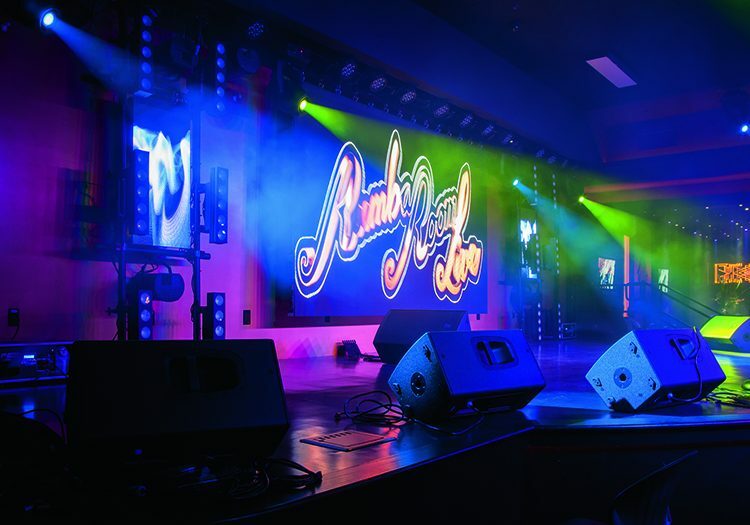 With the different areas within the venue, the audio installation was destined to be somewhat of a complex issue, which is why Props AV, an audiovisual design / build firm was contracted for the technical design and installation at Rumba Room Live. Suspended over the stage area, Michael and his crew flew a total of 10 D.A.S. Audio Event 208A powered three-way line array enclosures, with five elements each for the left and right hangs. For low frequency support, there are four Event 218A powered subwoofers under the stage, while eight D.A.S. Action-12A powered loudspeakers are used for stage monitor purposes, as well as an Action-15A powered enclosure. Additionally, the setup provides an additional two Action-12A enclosures that serve as the DJ’s monitor setup. The eight additional zones are outfitted with a total of 14 D.A.S. Audio Artec 508 two-way, passive loudspeakers. These zones include the lobby, six VIP areas, the bar, and a walkway area. Five D.A.S. Audio D Series amplifiers are used to power the loudspeakers, with two D.A.S. Audio DSP-4080 stereo / mono DSP units for loudspeaker management. The D.A.S. 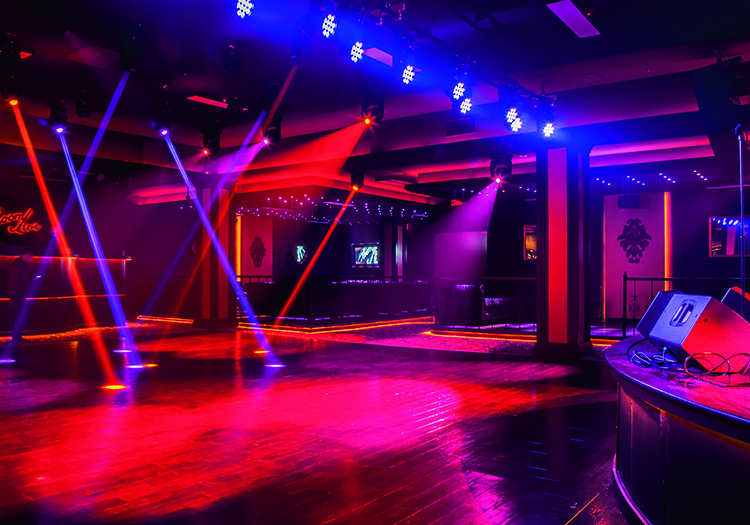 Audio system was the perfect choice for Rumba Room Live, according to Michael, who discussed their suitability further: “The Event Series offered the ideal dispersion characteristics required to cover the dancefloor with more than adequate sound pressure. 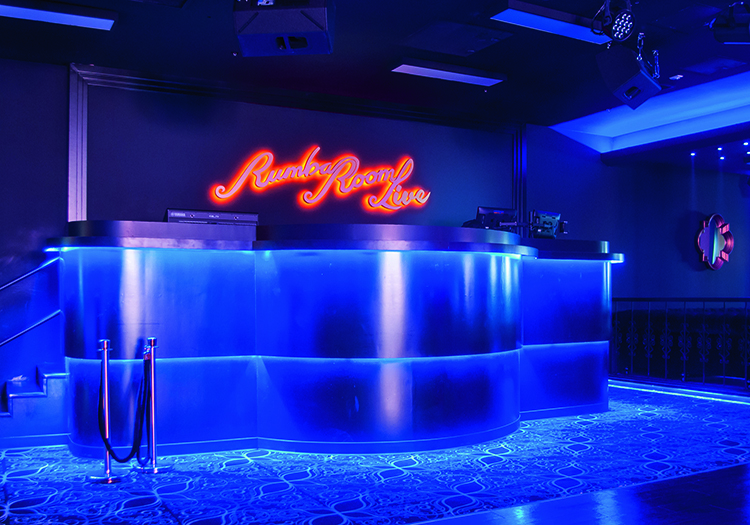 As well as the audio install, the Props AV team also worked with Rumba Room Live’s architect and ownership to develop the design and look of the venue. This meant that Michael and his team were responsible for designing, supplying and installing the lighting and video aspect of Rumba Room Live. 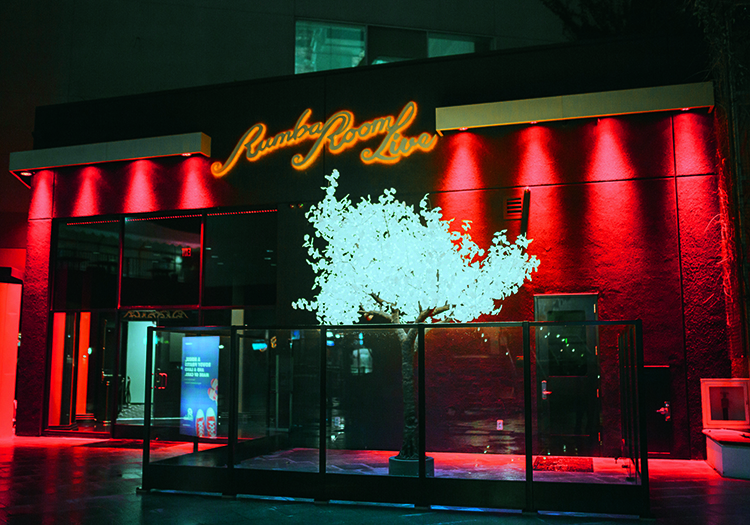 Starting with the exterior, Props AV used 12 Elation SixPar 200IP fixtures with six-colour LED multi-chips to downlight the Rumba Room Live façade in a wash of customisable shades. These fixtures provide an almost infinite range of colour choices, allowing the venue to fully tailor the outdoor look to match any event. Inside the venue, the interior glass in the lobby is downlighted using seven Elation ELED QA Strips, while Elation Flex LED Tape WP downlights the counter of the box office. Both the exterior and lobby areas are controlled by an Elation ART500 touch panel DMX wall controller, which offers simple navigation with presets for simple colour changes. In the club area, there is a 4 x 3 LED screen, the first of four that are in the venue, which is made up of 12 Elation EZ4 video panels. The high-resolution panels create sharp, stunning imagery with vivid colours, making them the ideal choice for running videos and graphics in the club. 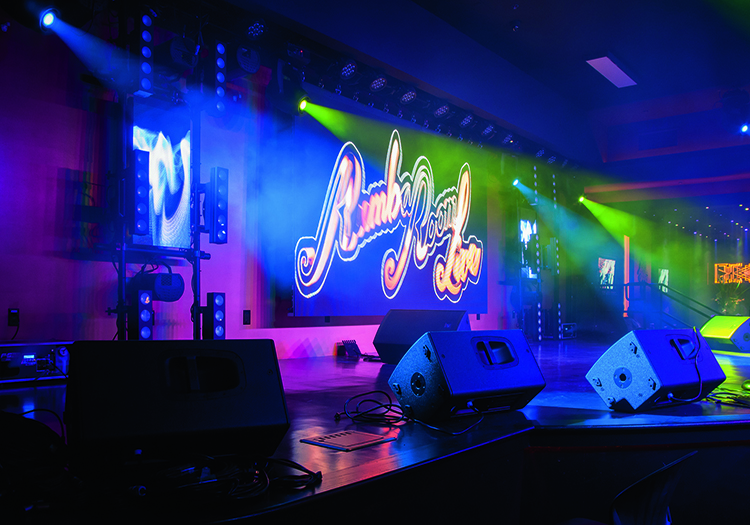 The entry screen, which displays the Rumba Room Live logo and images of upcoming events, is controlled using ArKaos Media Master. Both bars in the venue are decorated with Elation Flex RGB LED tape, offering a tasteful design of colour-changing decorative light. 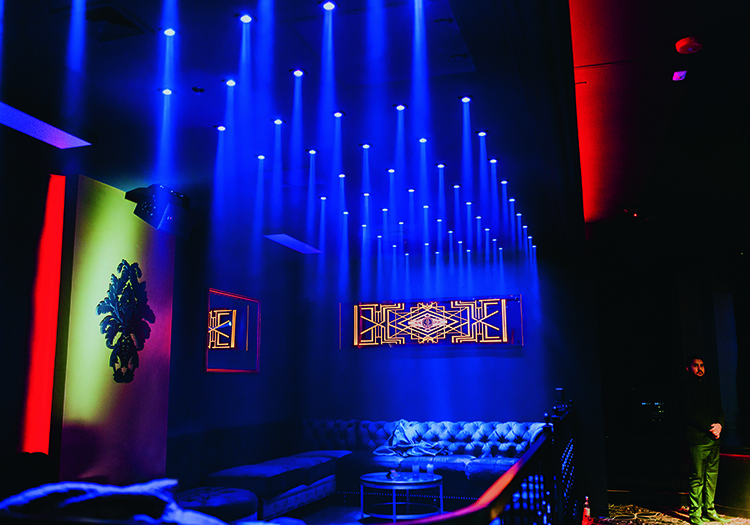 The Flex RGB LED tape is used in the visually-striking VIP areas to downlight platforms and floating walls, with Elation Elar Q1 PAR lights, pixel mapped using ArKaos Media Master software, also used to a stunning effect. Elation Platinum Spot LED Pro II moving heads are used to lead guests from the bar area to the dancefloor and stage. This is where visitors to the Rumba Room Live experience the full impact of the visual scheme put together by Props AV. Three LED screens, made up of 32 EZ4 video panels – a large 7 x 4 centre screen and two smaller 1 x 2 screens placed stage right and left – dominate the area. For the control, ArKaos Media Master is used once again. Above the dancefloor is a rig of 10 Platinum Spot LED Pro II moving heads, eight Rayzor Q7 LED moving heads and eight Rayzor Beam 2Rs moving heads, with more than enough power to cut through the other lighting. Also in the rig are four Sniper 2R multi-effect lights – Elation’s unique beam, scanner and laser simulator in one – as well as a pair of SixPar 200 LED Par lights, while Flex RGB LED tape is used again on the DJ booth. For the lighting around the stage, 12 compact Rayzor Q12 Zoom LED wash moving heads work from a downstage position, with 15 upstage SixPar 100 LED Par lights and six Platinum Spot LED Pro II fixtures upstage and stage left and right. Used for upstage washes of even colour are 12 CuePix Tri Strips, with eight Sniper 2Rs providing upstage effects. Flex RGB LED Tape is used to highlight the stage border, while atmospheric effects come from a pair of Antari F-5D Fazers. The technical install at Rumba Room Live is a great example of how technology can enhance a venue, helping to create a real atmosphere for the guests. 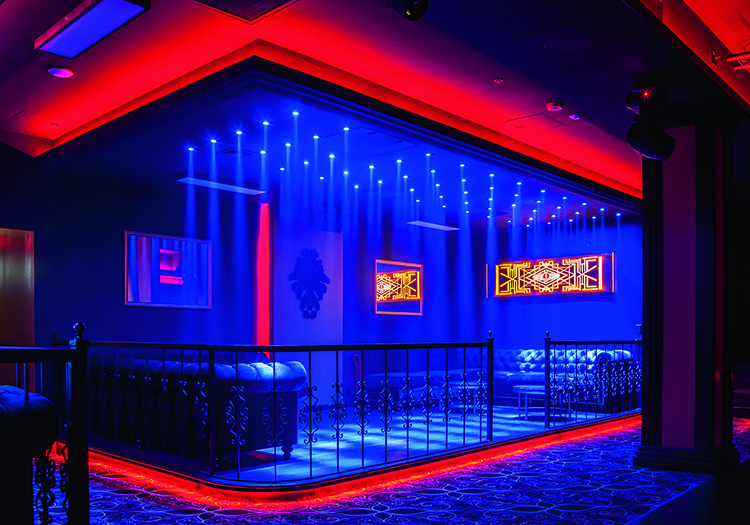 Since its opening, Rumba Room Live has vastly improved the entertainment scene in Anaheim, delivering an authentic experience of Latin culture. The club’s formula of playing the best in Latin music, while hosting live performances across a variety of genres has proved extremely popular.